Forget the nut roast this Christmas and serve these vibrantly-coloured puff pastry tartlets. Topped with beetroot and goat’s cheese puree and sweet roasted carrots, they are a perfect vegetarian showstopper main course. Especially as it can be made prepped ahead and assembled just before serving. You can also make this as one large tart. Heat the oven to 200C. Toss the carrots in half of the oil and lay on a baking tray. Lay the beetroots on a large sheet of foil, rub with the remaining oil, cover in the salt and wrap loosely; lay on a tray. Roast the beetroot for one hour and the carrots for half an hour. Keep the oven on. Cut the puff pastry sheet into 3-4 rectangles or circles. Lightly score a 1 cm margin around the edge. Lightly prick the centre with a fork. Place each piece on a baking sheet and bake until pale golden and crisp – about 15 minutes. Remove from the oven and lightly press down the puffed centre. Cool on a baking rack. When beets are cool, rub off the skin and chop the beetroot. Add the beetroot to a blender or food processor, along with the goat’s cheese and blend until smooth. Stir in the lemon zest and 50g of hazelnuts. Cover and refrigerate for half an hour to thicken. 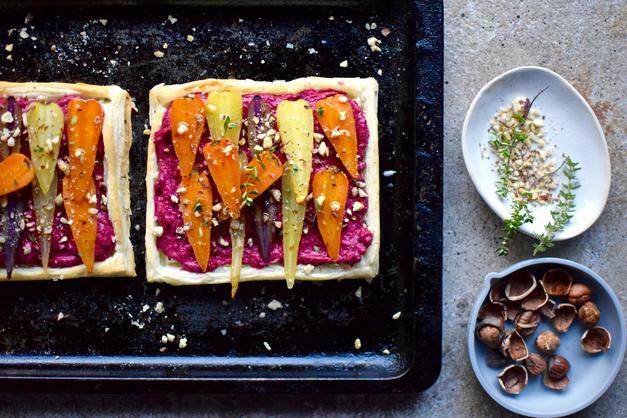 To assemble, spread the pastry bases with the beetroot mixture – you may have a little bit left so consider it a cook’s perk. Cut the carrots in half vertically and lay on the beetroot, either in rows or overlapping randomly. Sprinkle over with the thyme leaves and remaining hazelnuts. Serve with a lemon wedge or a drizzle of balsamic glaze.